I think it’s fair to say it’s been a particularly difficult week for women in technology. The Grace Hopper Celebration decided to invite a panel of “male allies” to talk about fixing sexism in tech. (Panel members included the CEO of GoDaddy, known best perhaps for its sexist advertising campaigns). Microsoft CEO Satya Nadella said that women shouldn’t ask for raises; they should trust “karma.” And tech educator Kathy Sierra deleted her Twitter account (@seriouspony), leaving behind a really chilling blog post (Wired version) about her ongoing experiences with harassment and trolling. In response, Adria Richards shared some of her experiences with violent threats and harassment as well. Some people in education technology continue to dismiss this rampant misogyny as something that the tech sector suffers from but that education is somehow immune to. Education and ed-tech are not immune. Malala Yousafzai won the Nobel Peace Prize today (sharing the prize with Kailash Satyarthi) for her work campaigning for girls’ right to an education. She is the youngest person to win the award. 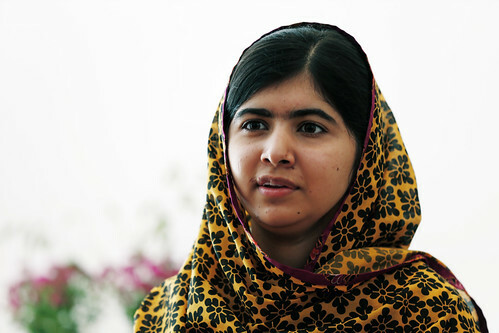 Yesterday marked the two year anniversary of her being shot by a Taliban gunman as she boarded her school bus. The Philadelphia School Reform Commission canceled its teachers’ contract this week, prompting students in Philadelphia to go “on strike” in support of their teachers. The US Supreme Court has rejected the appeal of Ohio public school teacher John Freshwater, who was fired for promoting creationism and refusing to remove religious items from his classroom. “The Los Angeles school district’s bond-oversight panel has rejected a move by officials to spend an additional $42 million on new computers, including purchases under a controversial—and recently suspended—technology contract.” LOL LOL LOL. From Vanity Fair: “If Kentucky Senator and Republican presidential hopeful Rand Paul has his way, classroom sizes will someday rise well beyond their existing ratios of 15-to–1 or 30-to–1. ‘I think we should go to a million to one,’” said Paul. I think he'd be a perfect keynote speaker for SXSWedu. A MOOC about abortion. A MOOC on Ebola health care advice. For-profit giant Kaplan University launches “Open College,” which “will include free online services and personalized mentoring to help people identify and organize prior experience and skills that could count toward a degree or move them closer to a new career. It will also provide fee-based services, under a subscription model, that will offer ways for students to satisfy the remaining requirements for a bachelor of science degree in professional studies from Kaplan University.” And it will also serve as the latest example of “openwashing” in education. The University of Southern Maine will cut 50 faculty positions and eliminate two academic programs as it tries to deal with budget deficit issues. And in other “shaming women news,” George Will has been uninvited to speak at Scripps College because of an op-ed he wrote about campus sexual assault. The Smarter Balanced Assessment Consortium, one of the two Common Core assessment initiatives, says that its executive director Joe Willhoft is stepping down and will be replaced by Chief Operating Officer Tony Alpert. Ellucian has a new CEO: Jeff Ray. Jim Blew will replace Michelle Rhee as the head of Students First. The Digital Reader’s Nate Hoffelder broke the story this week that Adobe Digital Editions has been collecting users’ reading data and sending it back to company servers in unencrypted text. It’s this week’s “What You Should Know…” over on EML, and The Digital Shift has a good summary too about the privacy implications for readers and for libraries. The Academy of Art University used to grant students permanent licenses for the Adobe CS6 Master Collection as part of their tuition. But apparently Adobe has deactivated these licenses, without any warning, demanding students now pay a $60/month subscription fee to continue access. “Will Curriculet’s Rentals Mark the End of Physical Libraries?” asks Edsurge. Investors have their fingers crossed, I guess. Also from Edsurge: an app you can auth via your Twitter account that will tell you which educators to follow and what to read (on Edsurge). GitHub has launched a “Student Developer Pack,” offering a free Micro account along with discounts on a number of other developer tools. Bill is on a roll, with a look too at Remind’s privacy policies. On the heels of a $40 million investment in the messaging app last week, it’s definitely worth looking more closely at what happens to student, family, and teacher data. Microsoft has launched OneNote Class Notebook Creator, which PC World describes as “a classroom assistance application for OneNote and SharePoint Online in Office 365” and Microsoft describes as “a flexible digital framework for teaching and learning.” Right. “Blackboard’s Boss Wants You To Hate His Company Less.” Good luck, Jay. ScienceOnline is shutting its doors. “Is It Ever Okay to Make Teachers Read Scripted Lessons?” asks The Atlantic. Its answer: Yes, in Africa. So there you go. TurnItIn, plagiarism detector and cavalier appropriator of students’ IP, has acquired the automated essay grading software LightSideLabs, and John Warner’s write-up of the “embargoed press release” is just perfect. CL Educate has filed the paperwork for an IPO, Edukwest reports. The company operates test prep centers in Dubai, Abu Dhabi, and Northern India. Fedora, an e-commerce startup that lets teachers sell their classes online, has raised $1 million from Kamal Ravikant, Naval Ravikant, Matt Brezina, Aaron Batalion, Billy Draper,, Winklevoss Capital, Maiden Lane Ventures, AngelList Syndicate Fund, and Adam Foroughi. You know if the Winklevoss twins are in on it, it’s gotta be grand. Adventure to Fitness, which makes online fitness videos for kids, has raised $1.5 million from undisclosed investors. 10 Minutes With, a career matching service for college graduates, has raised $4 million from undisclosed investors. This brings to $4.4 million the total raised by the startup. Nepris, which also offers career matching but for lower grade-levels, has raised $550,000 from NewSchools Venture Fund, David Better, David Matthews, Kent Novak, and Pradeep Sethi. Tuva Labs, which wants to bring “data science” into the K–12 classroom, has raised $430,000 from NewSchools Venture Fund and the Ben Franklin Technology Partners of Southeastern Pennsylvania. Primo, which makes a toy to teach kids programming, has raised $750,000 from Ibis Capital, MTS, and Emerge Education. The startup had previously raised £56,666 via Kickstarter. For $150 a quarter, you can get Edsurge’s Ka’Ching report, detailing all these funding announcements. “The World Needs 4 Million More Teachers To Get Every Child In A Classroom,” says UNESCO. “The National Science Foundation earlier this month awarded a $4.8 million grant to a coalition of prominent research universities aiming to build a massive repository for storing, sharing, and analyzing the information students generate when using digital learning tools,” reports EdWeek. The project, called LearnSphere, will gather “clickstream” data, chat dialogues, and “affect” and biometric data. Ya know, for science. Does your university require you use an LMS? Colorado State University history professor Jonathan Rees wants to know. The week in education maps and charts: college football fans, college majors.